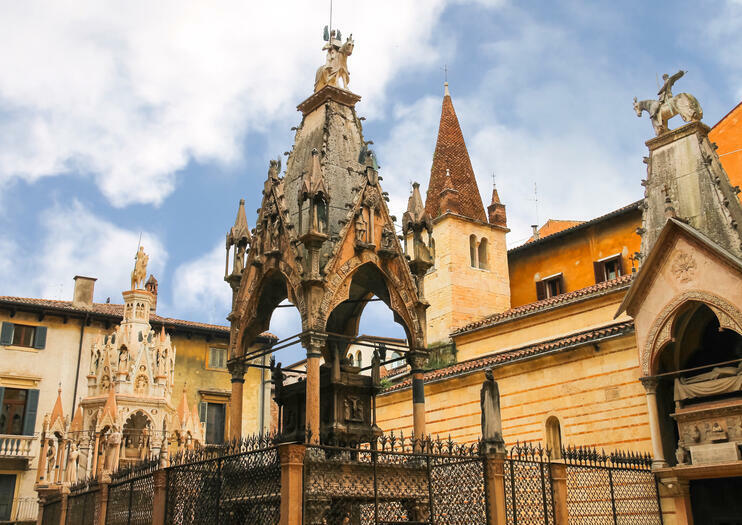 Commemorating the influential Della Scala family, the Scaliger tombs are a series of five Gothic funerary monuments found outside the Santa Maria Antica church in Verona. Dating back to the 14th century, the monuments are famous for their elaborate decoration. In the 13th and 14th centuries, the Scaliger family (also known as Della Scala) ruled the city and wielded a great amount of power. Here, the first tomb built—attached to the exterior church wall—belongs to Cangrande I, the most famous of the family dynasty and the protector of the poet Dante. A statue in his likeness on horseback, decorated with harnessed dogs, fronts his tomb (cangrande means “big dog” in Italian). Other tombs memorialize Mastino II, watched over by a pair of angels, and Cansignorio, whose tomb is the most ornate, with sculptures of warrior saints. The last two tombs stand in memory of Alberto II—simple without a canopy—and Giovanni, whose tomb is also built into the church wall. You can view the Scaliger tombs for free from behind the ironwork fence, or you can pay the entrance fee to see the monuments up close. Purchase a Verona Card for free entrance to the tombs. Join a guided walking tour to find out more about the Scaliger family. The Scaliger tombs are housed in the courtyard of Santa Maria Antica church in central Verona. They’re easily walkable from other areas the city, and they’re accessible by local bus. Walking tours often combine a trip to the tombs with other memorable sights around the city. The church and courtyard at Santa Maria Antica are open daily. You can pay to enter the courtyard during the daytime, but the tombs are also worth visiting at night—even if you only view them from behind the ornate fence—when floodlights casting long shadows create a spooky atmosphere. While you’re visiting the tombs, make time to step inside Santa Maria Antica church, which was built in the 7th century AD and went on to serve as the private chapel to the Scaliger family. With striped walls of tufa and brick, the building is a wonderful example of Romanesque architecture. Join an unforgettable tour in our family Winery with the winemaker!We are a small Winery boutique in the heart of Valpolicella and we organize activities to share our passion for Valpolicella and Amarone wines with our guests (we offer it directly, without intermediaries or tour operator).We’ll start with a walk in the vineyard, telling you the family history about the winery and the estates. You’ll learn how to dry Amarone grapes in the traditional drying room, a process called Appassimento. You'll visit our rural house and the cellar from the 17th century used for winemaking and refinement. At the conclusion, the tasting of a selection of our fine wines Valpolicella, RIPASSO and the great AMARONE, learning how to evaluate them by sight, smell and taste. You’ll also enjoy our organic EXTRA VIRGIN OLIVE OIL, local cheeses called Monte Veronese and Soppressa Valpolicella (a kind of salami). We’ll be waiting for you on our amazing terrace with a stunning view of the Valpolicella! Spend a day in Verona on a trip from Lake Garda, and discover the charms of a city with Roman ruins, links to Shakespeare, and an Old Town with an abundance of elegant shops. On a tour, you’ll see and learn about Verona’s showpiece sights include Juliet’s House, the Pietra Bridge, and the shopping street of Via Manzini. Round-trip transport from Lake Garda region hotels is included. Verona is a charming and unique italian city. Discover it with a local and a Professional Licensed Tour Guide, a tour guide who was born in Verona and still lives there. Walk on its open and colorful squares, learn about its glorious past and its lively present. Admire the beauty of its highlights and discover its hidden corners and gems. Follow the water of the river surrounding the old town, and look at the enchanting hills with their vineyards, cypress and olive trees. Finally you will fall in love with Verona! Verona is known all over the world as the city of love because represents the place where was setted the tragedy of Romeo and Juliet narrated by Shakespeare . You will find out the Juliet's house and its famous balcony that today is one of the main attractions of the city for tourists all over the world.Experience the best of the City in a 2-hour walking tour with a professional local guide who you will conduct you among the secrets of Verona, learning about its history and culture!Share this experience with a small group of people choosing the morning tour or the afternoon one! As the setting for Shakespeare's Romeo and Juliet, Verona is one of Italy’s most romantic cities, but taking in the sights with dozens of other tourists can detract from the experience. This private 2.5-hour walking tour offers a more intimate experience, so you can enjoy the undivided attention of your guide as you visit Juliet’s Balcony, Romeo’s House, the Basilica St. Anastasia, Piazza dei Signori, and more. Follow the clues to solve a 700-year-old cold case on a fun and interactive murder mystery tour in Verona. Uncover the true story behind the murder of Cangrade della Scala, a Veronese lord, as you solve riddles on a scavenger hunt that takes you to landmarks of medieval Verona including the Castelvecchio, Piazza Bra Sant’Elena church and the Scaliger Tombs. What if Shakespeare’s starcrossed lovers Romeo and Juliet actually had a different fate? When visiting Verona, solve a mystery based on the Bard’s tragic tale by solving a series of puzzles and clues that take you through the ‘City of Love.’ Have fun putting the pieces together as you travel to landmarks like Juliet’s House, Piazza delle Erbe, the Scaliger Tombs and Forti Palace. Along the way, boost your brain power with a complimentary snack and drink. With this tour we'll discover the historic center of Verona with a guided tour.We'll start from Castelvecchio, imposing Castle of the Scaligery family, ancient governors of the city. From here we'll walk on one of the biggest bridges of Europe.We continue towards the squares and the houses of Romeo and Juliet. In "Piazza delle Erbe" we'll be welcomed by the market and the beauty of the frescoed palaces.We'll continue towards "Piazza dei Signori" where we'll admire the imposing palaces and then towards the "Arche Scaligere", graves of the Scaligery family.We'll walk along Via Mazzini and in the end, we'll reach Piazza Bra, with the symbol of the city: The Arena of Verona. Here our tour of the city, declared UNESCO World Heritage. Я - филолог по образованию, и рассказывая о городе я не концентрируюсь на сухих датах. Мне важнее помочь вам заметить те уникальные детали, которые делают этот город свидетелем двух тысячелетий истории, где красоту создают и умело сохраняют. Моя цель - показать как именно сформировалось то, что мы можем увидеть сейчас, как менялся город, как адаптировались его жители к современности, при этом стараясь не растерять накопленные предками памятники старины. Ведь в Вероне, как в капле, отражается весь север Италии, с его разнообразием влияний и изяществом архитектурных стилей. Discover the beauty and history of Verona, home of Shakespeare’s star-crossed lovers in ‘Romeo and Juliet.’ On this 2-hour tour, admire the city’s most important monuments on a sightseeing drive, and then stroll through the winding heart of town on a guided walk. See the Roman bridge and amphitheater, the 16th-century city gates, Piazza delle Erbe, Juliet’s House and more while learning about Verona’s rich legacy.